THE 26 JUNE ELECTIONS, AND THE FRONT OF THE LEFT – A left coalition agreement between PODEMOS and IZQUIERDA UNIDA (IU) has been reached in Spain for the 26 June elections. In the general elections of December 2015 in Spain, the Popular Party (PP) – Conservative Party headed by Mariano Rajoy (presently Acting Prime Minister) – did not get the majority needed to govern. As the PP subsequently failed to form a coalition with any another party, new elections are to be held on this 26 June. In preparation for this, the political left has organised its forces. Podemos announced its decision to work electorally alongside Izquierda Unida (IU) on an anti-austerity programme in 50 points. 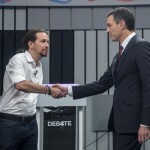 Iglesias meets Sanchez, the leader of the Socialist Party, PSOE. The combined electoral strength of Podemos and IU seems greater than that of the Socialist Party (PSOE). The left is now in a better position than before to leave behind the dead-weight of the imperialist right-wing of the PSOE. Podemos means “We Can”. It regroups a number of social movements formed at the time of the Indignados in 2013-14. In the 2015 elections, Podemos came third, winning 5 million votes, 21% of the ballots cast. Izquierda Unida (IU) has origins in the Communist Party. It is remarkable that it won almost 1 million votes in December 2015. As Podemos refuses to associate with the right wing Party Ciudadanos (also a very recent creation), it (Podemos) declares its readiness to “pull together” with IU on the basis of a joint left-wing program in 50 points. 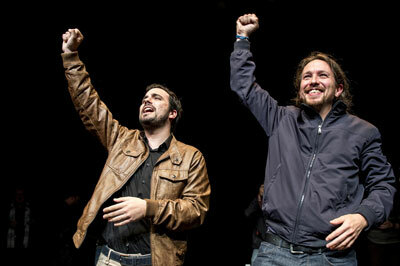 The feature image shows Pablo Iglesias (Podemos) and Alberto Garzon (IU) on their electoral platform. A left coalition agreement between PODEMOS and IZQUIERDA UNIDA (IU) has been reached in Spain for the 26 June elections. In the political context of the country, this is a very important and qualitative change. 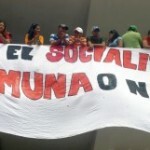 This agreement was strongly wanted in the political grassroots and the social movements. It shows that the left can become a force alternative to the PP. The 50-points program comes under the heading: “CAMBIAR ESPANA – TO CHANGE SPAIN”. It is a riposte to the austerity policies imposed on the Rajoy government by the European Union. In one main points, the program envisages to raise funding for health, education and incapacity/dependency. Over the last years, the health sector was cut by 12 billion Euros and more than 50,000 jobs were lost. The coalition’s program wants the health budget back at its pre-2008 level. Among other things, the coalition wants a monthly income of at least 600 Euros for everyone. Pensions must rise with the consumer price index. Services to the aged must become 100% public and universal. The coalition will revoke the pro-eviction laws passed in 2010 and 2014 by the PSOE and the PP. What is left in the social budget will finance environmental policies, community services and culture. The introduction of progressive taxation will bring more revenues. So will raised taxes on large property, donation and inheritance. Measures will be taken against fiscal paradises. Account holders and multinationals who use those system to avoid tax will face the law. In the trade union field, the 50-points program will overturn the laws against labour rights. This was the work of the PSOE and PP in 2010 and 2012. The coalition will introduce a Working Class code instead. In the first 2 years of the coalition government, the national minimum wage will rise to 800 Euros per month (it was 756 Euros in 2015). This, and other policies, will combat precariousness. It will stimulate the participation of the workers in the management of enterprises. It will end gender discrimination. In one year, most short-term contracts will have given way to secure jobs. General redundancy laws and wage bargaining by sectors will want to replace negotiations per enterprise. The 50-point program will make one bank out of all the State-controlled banks (Bankia, Banco Mare Nostrom, ICO). The State will retake all end-of-lease hydro-electric installations, and prevent fracking. The budget deficit will be re-paid over more time, and the directives of the European Commission in this matter will be combated. 1,400.000 households cannot afford basic needs. The Podemos-IU coalition will distribute vouchers to those in particular need. Evictions will not be permitted if people cannot pay. Retroactive repayment of arrears will be made possible. Social housing to be built, with rents no greater than 30% of the wage. Financial enterprises and developers who sit on empty stocks of houses will be punished. A new law on Education is going to involve all persons concerned. Higher Education will be free, and in the University and Research departments, the first outline of that law will set out that knowledge is to be put at the service of society. The struggle against corruption will redouble; and in the enterprises, revolving-door ministers and political others will not be allowed to sit on the management boards. The citizens will have the right to recall the leaders who ignore electoral promises. The liberty of expression, assembly and demonstration will be guaranteed. The PP’s gagging laws will be repealed (the Mordaza laws). The Law called Memoria Historica – giving the right to investigate and punish the crimes committed under Franco – will be enforced: to obtain truth, justice and reparations (compensations) for the victims of franquismo. The coalition rejects Free Trade Treaties like TTIP and CETA. These threaten the sovereignty and functioning of the European countries. The agreement insists on respect for the dignity of immigrants and their right to asylum. It recognises the Palestinian State and the right to self-determination for the people of the Western Sahara. In a concentrated attack on the Podemos-IU front, the rightwing and the media wheel out Bolivarian and Communist spectres. The Spanish bourgeoisie attacks the pro-Chavista left, particularly now that anti-Chavistas are a majority in the parliament of Venezuela. Big crisis sinks the PP under large-scale corruption and the failure of its austerity policies. Led by Jose Maria Aznar, the extreme right of the PP insists on economic measures to supposedly reduce the public deficit, with a frontal attack on the poorest if needs be. The new right wing Party CIUDADANOS has gone down in the polls since the last elections. To get spoken about more, it went to Venezuela to defend anti-Chavista “democracy” and its jailed delinquents. 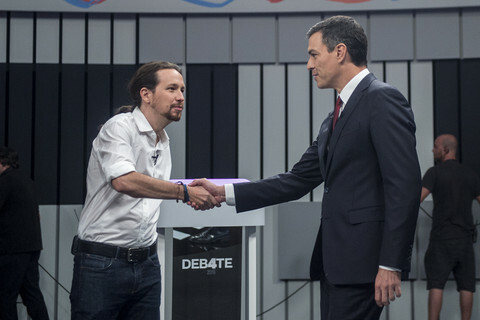 The 26 June elections had to be called because the PSOE would not share in an alliance with Podemos for a government of the left. It is the PSOE’s apparatus that forced Pedro Sànchez, its general secretary, to pass an accord with right-wing Ciudadanos. This situation makes it harder to fight for more advanced measures in the economy, and a more complete cancellation of the old Labour Laws. The Podemos-IU united Front stays within a left Social-Democratic framework; it does not pose the leaving of Nato, the non-repayment of the debt, or its restructuring; but it is an important project, however. This Front acts as a centre. 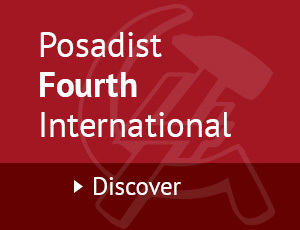 It stimulates the participation of the working class movement, the social movements and the general left. It is also going to attract the large sectors of society wanting to take part and bring change. To reach that point, it will be necessary to develop the program more fully with measures of nationalisations, more participation and more social control. This is the only way to face up to the reaction of the bourgeoisie of Spain and of the European Union. Jean-Claude Juncker of the European Commission and EU officials estimate that Spain’s repayments are off target, and that therefore, 10 billion Euros in additional cuts are now wanted, instead of any slowing down of the repayments.